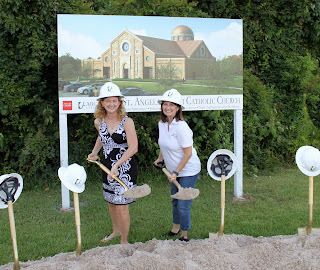 Our parish recently celebrated the groundbreaking for our new church building. 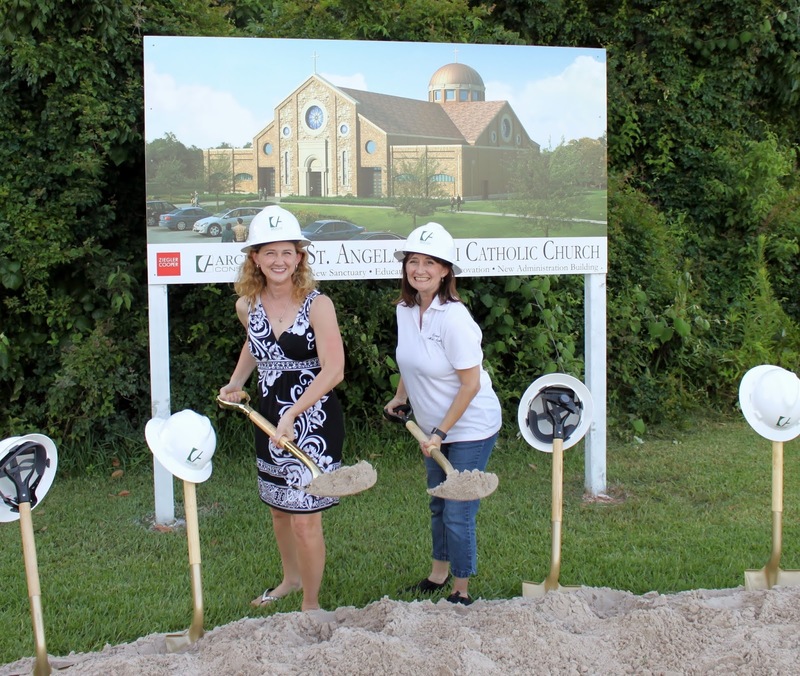 The semi-casual event included parishioners of all ages gathered in lawn chairs on the edge of the parking lot, squinting at the shovels stuck in the mound of dirt while waiting for the brilliant sun to sink behind the trees. No Mass is what was advertised, but a comfortable (brief) Liturgy of the Word celebrated with three priests, a deacon, and our Archbishop Emeritus provided ample ceremony. The breaking that defines our parish is to open suddenly because of pressure from inside. Pressure from inside. Our parish is experiencing expansive growth. With this groundbreaking you could say we are bursting at the seams of the old building; we are breaking out which means we must break ground. At the same time, groundbreaking means markedly innovative, introducing new ideas or methods. Archbishop Fiorenza referred to this in his homily, that we are growing much like the early church, the first apostles to preach the saving Gospel to newcomers. For some, the love of Christ is a markedly innovative, new idea. As he blessed the ground, the architect, the contractors – he thanked each of us for what we’ve done as a parish. And what have we done, these sweating families gathered in the space where grass and mosquitoes meet the concrete curb? We’ve created a parish community united in our strong bond of faith to show one another Christ’s healing love. This community of sinners, who are sometimes broken, help one another to be healed, to become new. When we struggle or fail, another is there with a helping hand, a kind word, or silent acceptance. The love we extend to one another is a powerful witness to the whole world. From this ground, broken through the strength of our love, will rise a new building where our families will welcome new families who will share in the glory of the Gospel and the sacraments. The "J" Club: Fr. Joy, Fr. John C., Deacon Jim, and Fr. John R.
We celebrated that love together that afternoon as we welcomed back our founding Pastor, whom Archbishop Fiorenza reminded us he had the pleasure to ordain. We celebrated with our current Pastor, whom Archbishop Fiorenza reminded us he also had the pleasure to ordain. As another side connection, I commented to Archbishop Fiorenza that he also had the pleasure of confirming me when I was a young teen. I look forward to celebrating in our new church building, not just because pews and kneelers will replace folding chairs, but because it marks the growth of our community and reminds us our differences and brokenness are superseded and healed by our common faith and love of Christ.